Global Coenzyme Q10 (CoQ10) Market size is expected to grow over USD 1.5 billion by 2024, owing to its favorable application overview for treating ailments such as cancer, Parkinson’s syndrome, cognitive illness, periodontal, kidney failure, neurological disease, cardiovascular disease, and Huntington’s disease. Industry growth is catalyzed by the use of coenzyme Q10 as a main constituent in the cosmetics industry, primarily owing to its antioxidant feature/property. Coenzyme Q10 supports the mental growth of a person and its use in everyday diet can help in inhibiting neurodegenerative disorders in aging populations. All these features will supplement the demand for Coenzyme Q10. 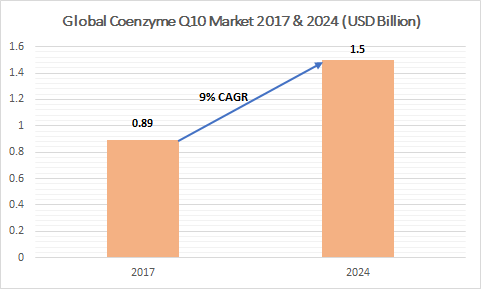 Coenzyme Q10 industry size valued over USD 890 million during 2017 is anticipated to record around 9% CAGR during 2018-2024. CoQ10 is the main component of anti-aging products due to its antioxidant feature. Furthermore, the geriatric population in China, Japan, U.S., Russia, and UK are fueling the demand for these products driving Coenzyme Q10 market trends. Furthermore, an increase in the amount of cosmeceutical companies targeting or focusing on skin care applications is predicted to boost coenzyme industry growth. Its use as an essential component in functional foods and energy drinks helps in improving aerobic cellular respiration which in turn drives the industry growth. However, the dearth of rules in regulating/controlling the use of coenzyme Q10 in therapeutic treatment is predicted to hamper industry growth. Limited/Restricted supply of raw material types such as tryptone, hexane, and peptone can adversely impact Coenzyme Q10 market price trend. Coenzyme Q10 industry is segmented in terms of applications and regions. The application segment comprises of cosmetics, pharmaceuticals, and dietary supplements. Coenzyme cosmetics application segment is predicted to exceed USD 140 million by the end of the forecast period with its growth attributed to its use in sunscreen lotions, anti-wrinkle products, and moisturizers. Pharmaceutical application segment is projected to grow at more than 9.5% during the forecast timeline. Cognitive, heart, and periodontal disorders occur due to Coenzyme Q10 deficiency and its use in successfully treating Parkinson and migraine ailments is predicted to increase coenzyme Q10 market share. Dietary supplements applications segment worth over USD 300 million during 2017 will witness considerable growth in coming years due to increasing awareness about malnourishment and growing health concerns. Further, enhanced use of CoQ10 enzyme in the oral spray, tablets, vegetable & soybean oil and hydrophilic gels is predicted to boost coenzyme Q10 market for the segment. Consumption of the coenzyme Q10 through dietary supplements improves blood proportion and aids the process of anti-oxidation, thereby helping in the prevention of metabolic disorders and oxidative stress. All these factors are projected to boost the demand for dietary supplements. Latin America is predicted to boost the Coenzyme Q10 market demand and the flourishing cosmetics market in Mexico and Brazil are predicted to supplement the regional growth. 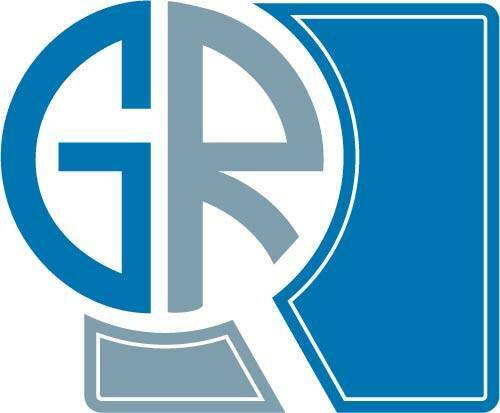 Furthermore, an increase in gross income coupled with favorable factors for therapeutic treatments is predicted to contribute towards the regional industry growth. North America, dominated by U.S. Coenzyme Q10 (CoQ10) industry share, worth over USD 270 million during 2017 is predicted to witness substantial growth due to major contributions by U.S. coenzyme Q10 (CoQ10) market in personal care products and functional beverages. Asia Pacific Coenzyme Q10 industry is predicted to record a CAGR of over 10% during the forecast timeline owing to the extensive demand for cosmetic products in India and China. Furthermore, rising awareness about dietary products as well as an increase in gross income has boosted the regional growth. Key industry players are Hwail Pharmaceutical, Pharmavite, SourceOne, Nisshin Sheifun, Kaneka, and Tishcon.